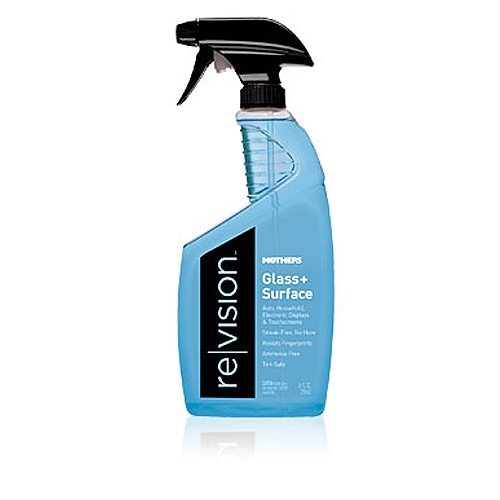 Mothers ReVision Glass & Surface Cleaner - 24 oz. Mothers® revisionTM Glass+Surface quickly removes tough grime, dirt, oily film and fingerprints from virtually any surface, leaving behind a sparkling clean, streak-free shine. This pro-strength, ammonia-free formula effectively cleans glass, mirrors, plastic and chrome, yet it’s safe for delicate window tint, gauges, GPS screens, smartphones, tablets, touch screens and other displays. It’s also great for home use on windows, countertops, appliances, TVs and monitors. Aero View - Interior and Exterior Window Cleaner - 16 oz. Meguiar's Perfect Clarity Glass Cleaner - 24 oz. Waffle Weave 500 Microfiber Drying Towel - White - 16" x 16"
Zero Pile 280 Microfiber Glass Towel - Blue - 16" x 16"